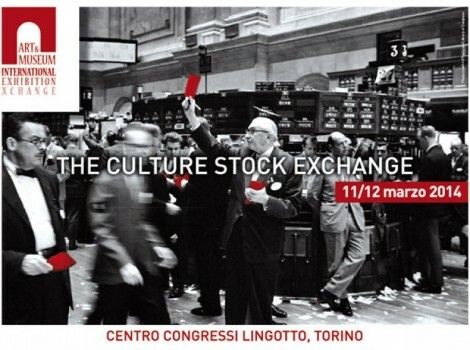 On the 11th – 12th of March 2014, at the Centro Congressi Lingotto, in Turin, is being held the start-up edition of AMIEX, the first European marketplace where Business and Culture meet for the development, the exchange and the co-production of exhibitions and cultural events. Originally the event was planned for early November 2013, but in order to guarantee the widest international participation also from extra-EU countries, it has been postponed to 11 - 12 March 2014. In November, anyhow, a dedicated preliminary workshop - "Towards AMIEX" - will take place to disseminate the results of a research on the phenomenon of exhibitions, and to highlight and present speakers and international partners who will participate in March to AMIEX 2014. AMIEX is promoted by Industry and Culture Foundation (constituted by Confindustria Servizi Innovativi e Tecnologici, Confcultura and Federturismo Confindustria), supported by British Council and Kingdom of the Netherlands and organized by GL Events. It is the first event in Europe dedicated to the development, co-production and exchange of projects related to the exhibitions (any exhibition, including the scientific ones) and their connected services. The event wants to be a b2b (business to business) marketplace and meeting place for temporary exhibitions organizers, public and business museums managers, institutions, private galleries, foundations, workers in the field of technological innovation and cultural tourism, and generally people interested in planning, producing, buying, selling, exchanging expositions and exhibitions. It offers two work days full of opportunities: meetings, conferences and workshops, expositions and a social dinner. AMIEX buds from the consideration that, in Italy, culture is considered worth around 36 billions euro of the italian Gross National Product; this extraordinary richness is not yet exploited enough. AMIEX is therefore a place where cultural heritage and related services get to be known and disseminated, for unlocking their economic potential. A pivotal role for a fruitful use of cultural heritage is played by the technological innovation: today the concept of exhibition is changing, just think to the virtual exhibitions only made for the web or for tablets and iPads. AMIEX wants Italy to be proactive and cutting-edge. AMIEX is the first European marketplace that connects culture and business to develop, exchange and coproduce exhibition and cultural events. It is not a trade show, not a fair, not a festival. It is business matching, an exchange agenda and networking opportunity.